Berlin based Front Row Society is pleased to announce the making of the first short film clip! 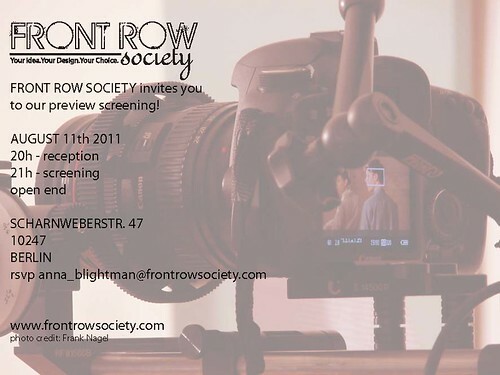 Front Row Society has had the pleasure of working with the founders of the International Filmmakers Network Berlin (IFNB), Robin Lochmann and Frederik Poppenk, on a short clip featuring wet paint, wine and what every stylish film needs: a Vespa. On a dreary Friday in the middle of July, cast, crew and Front Row Society film buffs met in Frank Nagel’s „Offener Raum“ in Friedrichshain. The dicky bows, rimmed glasses and lace dresses quickly set the retro direction that the film was to take. Beginning as an over-styled parody of stuffy art lovers and ending in a surreal scantily clad dance-off, the film successfuly underlined the creative freedom that FRS stands for. With Robin Lochmann’s direction, Florian Mag’s photography and Frederik Poppenk’s production work the day ran smoothly. The berlin based actors and models featured in the film and an enjoyable day was had by all. Front Row Society is a brand new international website based in Berlin that encourages young and aspiring designers from all over the world to create and submit designs into ever changing competitions that see the winning design being created into a limited edition production run. The brief and product will change every month, and we are currently in the middle of our first competition focusing on the handbag. The winning design is chosen by our community, people who have registered their interest, in a vote system. We provide a platform for designers to showcase their work, as all designs are entered into a gallery which can be viewed by everybody, therefore increasing exposure for the designers and an opportunity for their work to be produced at no expense to themselves. We also run a blog focused on design, art and culture.